Cover Photo: A familiar view of the TITANIC. A member of the film crew on the right gives the model scale. 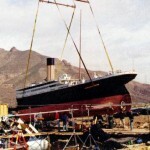 Many models of the RMS TITANIC were built for the 1997 blockbuster movie. Two of them were built by Western Boatworks of Reseda, California using WEST SYSTEM® products exclusively. The larger 1/8 scale model of only half of the ship (midship to stern) was 60′-long. A 1/20 scale model of the entire ship was 40′ long. They used the traditional cold molded method of diagonal planking over frames and stringers for both boats. However, for the 1/8 scale model they used sheets of plywood on the long, flat runs. Jay Kantola produced the full size patterns for all the frames, from the TITANIC’s sister ship, the OLYMPIC. Jay has been designing trimarans since the 1960s. Western Boatworks used WEST SYSTEM products throughout the construction of both models, a whopping six 55 gallon drums of 105 Resin and corresponding 205 Fast, 206 Slow and 207 Special Clear Hardeners. They also used a mountain of 404 High-Density filler and 410 Microlight® fairing compound for miles of fillets and a football field of fairing. An epic undertaking. 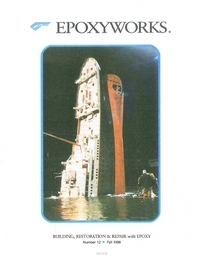 Unlike the original which was designed to be unsinkable, the 1/8 scale model was designed to sink many times. After filming the sinking hull from different angles, 10′ long sections were systematically chopped off and the remaining part of the hull was sunk again. The process repeated until only the stern section with the propellers and rudder was left intact. The 1/20 scale model remains whole and is headed for a museum. The crew of Western Boatworks, Richard Barrie, Stan Toliver, Billy Canty, Bryan Hough and Russ Peters, are all dedicated multihull builders and sailors. The complete 1/8 scale model during filming. 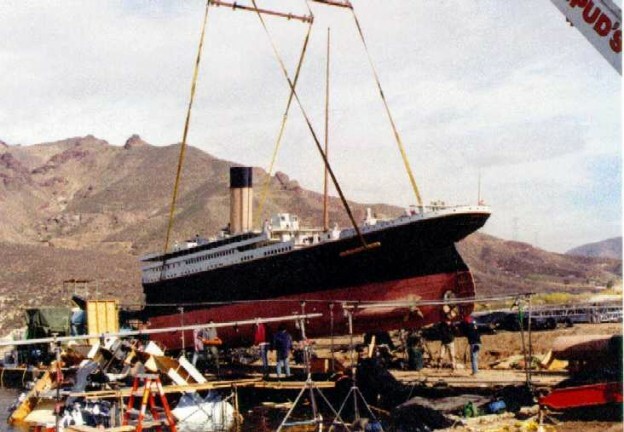 A familiar view of the TITANIC model sinking. A member of the film crew on the right gives the model scale. 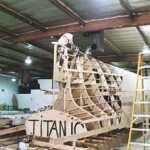 The 1/8 scale under construction at Western Boatworks. 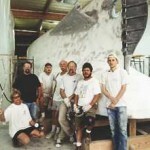 The crew of Western Boatworks in front of the faired hull. Richard Barrie, Stan Toliver, Billy Canty, Bryan Hough and Russ Peters. 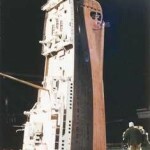 This entry was posted in Arts & Crafts, Weird & Wonderful, Yacht & Large Vessel Construction and tagged #12, cover story, Epoxyworks #12, Fall 1998, Richard Barrie, Titanic, Western Boatworks on August 13, 2014 by ewadmin.